The other day we heard about some small stream fishing - our favorite kind - about 3 hours from us. In the spirit of spontaneity we decided to jump in the car the next day and check it out. Fishing has been nearly non-existent for us so far this year and we were ready to catch and release a few nice cutthroat or trout. Plus the weather has been in the high 90's for what seems like forever and we knew it would be a tad cooler up higher. 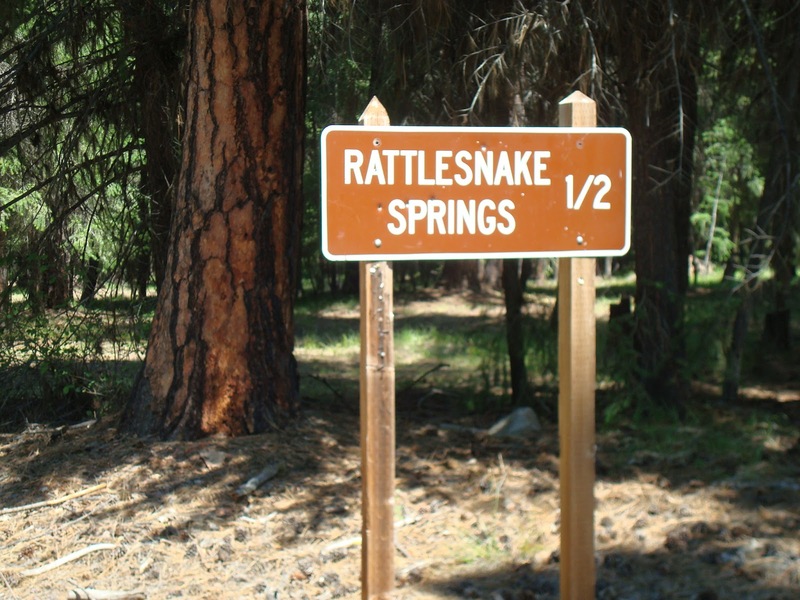 Why rattlesnakes, you ask? The river is called the Rattlesnake River! We really hoped that it wasn't actually named after the snake. There are a few rivers in this area that do have them and I am deathly afraid of the buggers! But, Mr. Squash and I are most certainly adventurous so we thought we'd take a look! We began by driving all the way up to a lake above the headwaters of the river. This was the view on the way up. 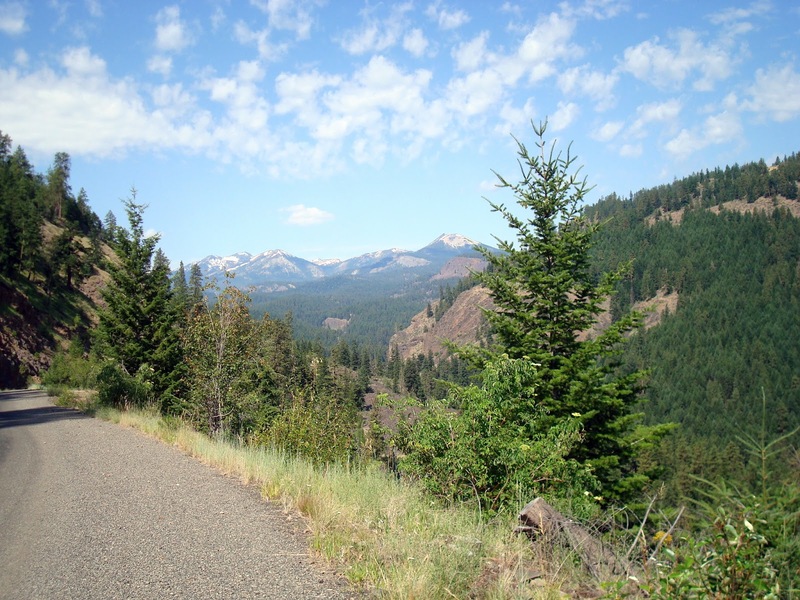 The distant mountains are around Chinook Pass. Here is the lake at the top. 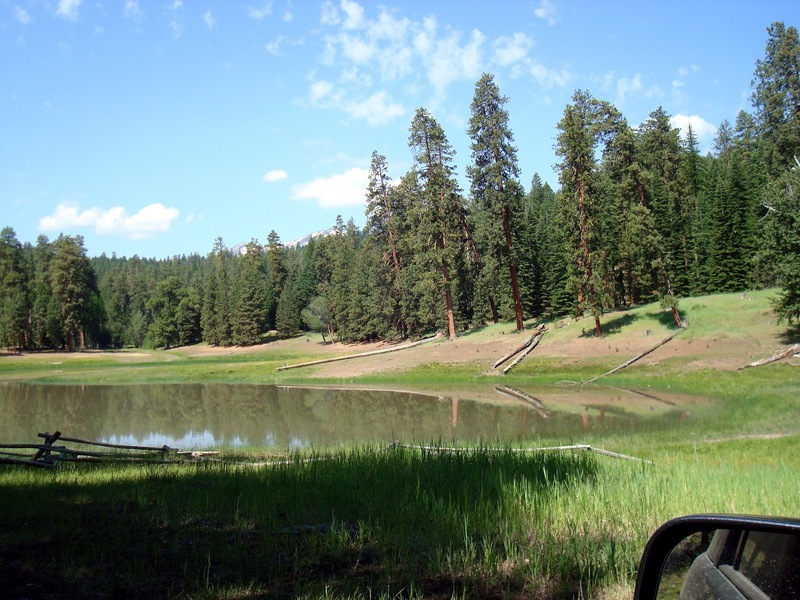 We were amazed at how low it was and the campgrounds around it were undergoing a renovation so no one was there. 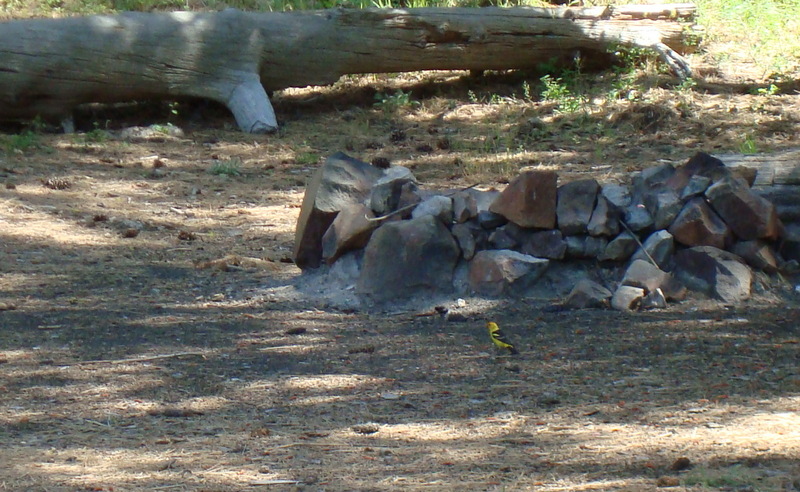 We spotted some colorful birds and I was able to get a quick photo before one flew away. Mr. Squash correctly identified it as a Western Tanager. Click on the photo for a better look. After that we drove 4 miles back down to the river. Here is what we found - still high and fast and not suited for fishing! We tried a few casts but all it got us was having to clean the gear for another day! I did, however, see a snake! Oh, Lordy, you should have seen me run! I don't think it was a rattler, but it was certainly bigger than a garter snake (or perhaps a well fed garter snake!). 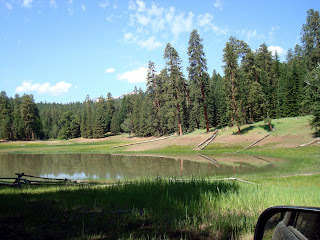 We drove down here after lunch but it was just a tiny stream and a lot of empty campsites. We even stopped at the ranger station farther down to see if they knew anything about rattlers in the area, but they didn't. Hopefully we can ask some fishing guides in the area what they know before we attempt to go back again! Here is Block #6 of my Cottage Rose BOM. I'm not crazy about this one - not enough contrast in lights and darks for my taste. The shop that is running this closed their doors, but I was able to buy the rest of the months and have them shipped to me. I was pretty bummed out by this, so I kind of lost my enthusiasm for the program, but I'm sure it will come back once I begin the next block! I was enjoying getting one each month and making it right away. Now that they are all sitting in a pile kind of takes the excitement of getting a new one each month away. Has this ever happened to you? I had to do some major trimming of my European Cranberry the other day. Rather than throw away all of the gorgeous branches with berries attached, I thought why not make an arrangement! I mixed them with some lace leaf hydrangea - unusual, but pretty! Yikes! 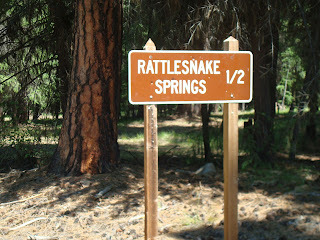 I want no part of rattlesnakes, or any other snake, thank you very much! Too bad you couldn't fish after all of that. I like your basket block, but don't blame you for losing steam with the BOM - it stinks that the shop closed. Love your flower arrangement and the table topper! Your fishing sounds dangerous! You have done a fine work with the baskets. The table looks beautiful with the topper and your arrangement. Your arrangements is beautiful with your pretty table topper. I was doing the Blogger BOM but sadly fell off the wagon. It's easy to get behind and hard to catch back up. Sorry your fishing trip didn't pan out but the scenery sure was worth the trip. Beautiful arrangement! The scenery on your trip is so gorgeous. Snakes? No thanks. I would freak out completely and scare off all the other wildlife. It is fun just to be able to take off like that and go exploring. Oh, no snakes for me. The black ones we have are bad enough. I have felt the same way about BOM. If you get behind or the thing that you are going through does take the enjoyment out of it sometimes. 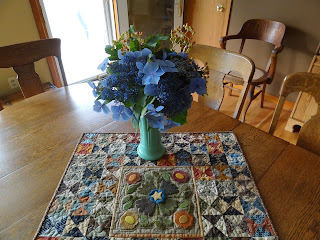 Love those blue flowers your little quilt. Oh, guess what? A raccoon came last night and climbed the deer fence and got into the corn. It was even ready to eat and they just destroyed it more than ate. OOOO! I am so mad! I guess it is time for an electric fence. Yikes! Rattle snakes... Scary! Sorry you couldn't do fishing at the lake! But I hope the drive and the scenery were pleasant. Your bouquet looks beautiful in the vase and the little quit underneath is so cute! It is disappointing with the BOM. 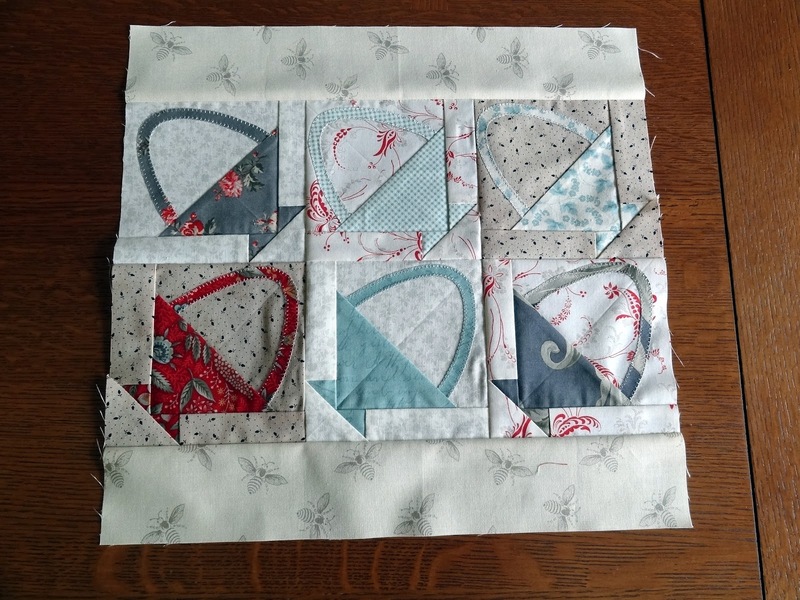 Is it possible to mix some of the fabrics from your stash for contrast? Too bad your fishing trip was a bust. But, like a certain car commercial that is out right now, the journey can be just as much fun as the destination! What a beautiful lake - sorry you weren't able to fish the river. 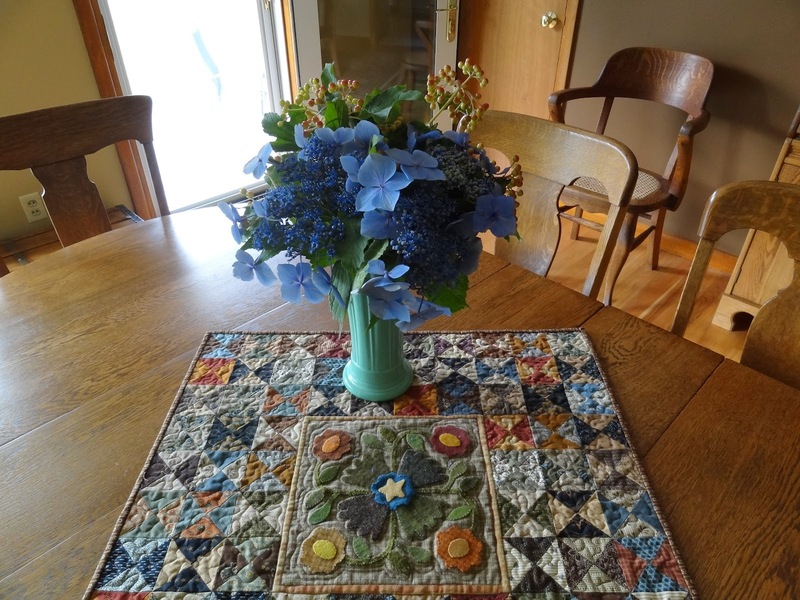 Your bouquet and the quilt under it are really beautiful on your table. Your table mats are so pretty with the flowers. Sorry to hear about your fishing trip. The weather is doing strange things at the moment. I was doing Village Green with my LQS but they changed the dates and then I started working more hours so couldn't continue with them. 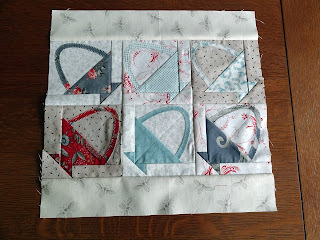 In the end I found the fabric on-line and made the missing blocks. It's good that you were able to get the rest of the fabric from the shop even though they stopped trading. Good luck with finishing it. I would run too!!!! Nothing like the startle of seeing a snake! LOL!!!! All the pics look so peaceful. LOVING the table topper!!!! GORGEOUS!!!! 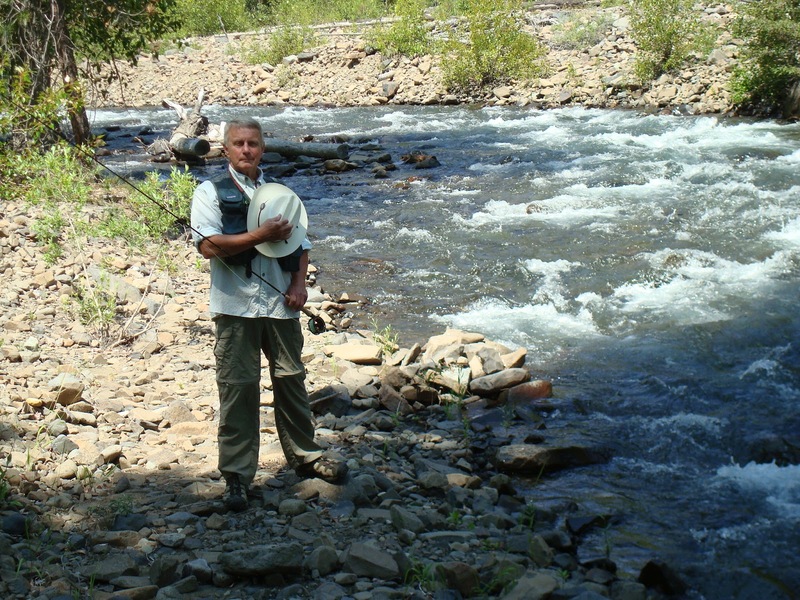 Sorry that your fishing trip did not work out--but thanks for the photo adventure! Lots and lots of rattlers around here. Not being a hiker, I have never seen one, but my daughter and son in law had to throw rocks to scare off a big one rattling near a local mountain trail a couple of months ago! Low contrast blocks are more interesting to me these days. It is curious how they actually can draw you in to see the mix of fabrics. Maybe you'll like them better when it is all together. Beautiful table topper under your beautiful arrangement. Too bad about the fishing! At least you got to set out on a fun adventure :-) The arrangement you made is beautiful. What a great way to use the trimmed branches. Yay - A Quilt Shop!